As a nanny to two young girls, I'm lucky that they love to get their nails done (with mom's approval and encouragement!) and while I'm at it- get to do my own! Their mom has a beautiful color selection and is very generous with sharing them with me! The girls are very into nails and often pick out their own color combinations and wait for me to pick mine, and promptly change it to match mine (or vice versa;) I decided for my nails to try this gorgeous purple (with some blue in it), Sinful Colors "Let's Talk" and accented my ring finger with Sinful Colors "Hottie", a light blue color that has silver and blue glitter in it! I love it! The pictures don't do it justice but I love it so much! I want to add these two to my collection very soon! Thanks Niki <3 I'm becoming a nail fanatic!! This is beautiful--LOVE how it looks! 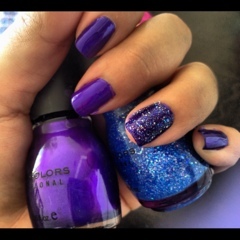 That light blue glitter on the purple is simply stunning!